Vanishing twin syndrome or disappearing twin syndrome is a term used to describe the spontaneous loss, or miscarriage, of one developing baby early in a multiple pregnancy. 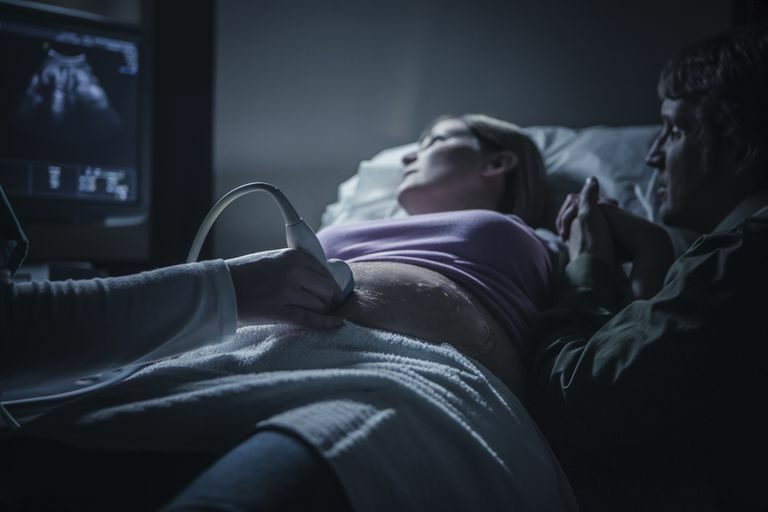 An expectant mother might have an early ultrasound that detects two gestational sacs, yet later on, only one fetal heartbeat is detectable and the second sac has disappeared. Or one normally developing baby is present alongside a blighted ovum. Some texts use the term "vanishing twin" for any pregnancy in which one baby in a multiple pregnancy is lost while the other survives, even if the twin has not technically vanished. However, the term is usually reserved for a twin that "vanishes" in the first trimester. Researchers suspect, however, that vanishing twin syndrome may be even more common, because it may frequently occur without detection. In multiple pregnancies that have continued beyond 20 weeks, researchers estimate that about 2.6 percent of twin gestations and 4.3 percent of triplet gestations will be affected by fetal death, although these are generally not considered vanishing twin pregnancies. In very early cases of vanishing twin syndrome, the woman might never know that the condition occurred. In other cases, the loss of the twin might be accompanied by some miscarriage symptoms such as vaginal bleeding and hCG levels that rise more slowly than in normally developing twin pregnancies. If you lost one of your pregnancies during a multiple pregnancy, there's no reason to believe that it happened because of anything you or anyone else did or did not do. Some cases of vanishing twin syndrome occur because of chromosomal abnormalities in the lost baby, but researchers do not fully understand why one twin is lost in other cases of vanishing twin syndrome. Intrauterine growth restriction (IUGR) - IUGR is a condition in which the baby does not grow as well as it should during pregnancy. For these reasons, your doctor might want to keep a closer eye on your pregnancy if you had a vanishing twin. However, it's very important to note that in most cases of vanishing twin syndrome, the surviving baby is not adversely affected. Most often the vanishing twin is absorbed by the mother's baby so that there is no evidence of the twin at the time of delivery. Sometimes, instead, a remnant of the twin remains, which is referred to as a fetus papyraceous. A fetus papyraceous is a paper-thin remnant of the baby. Uncommonly, a teratoma tumor may occur in which there are some remnants of fetal tissue such as hair or teeth. There appears to be a significant increase in vanishing twin syndrome in recent years. Since many vanishing twins would never be detected without an early ultrasound, the advances in technology for pregnant women could be part of the reason. Since fertility treatments are becoming more common and often increase the chance of multiples, and hence the chance of vanishing twin syndrome, this may also be a factor. If you have been diagnosed with vanishing twin, you probably have a lot of mixed emotions. It's normal to grieve the baby you lost while also feeling relief that you are still pregnant with your other baby. You should not feel that you have to pick and choose between your emotions. No rules say you cannot be sad and happy at the same time, and you shouldn't feel that you are dishonoring either baby if you go through a normal grieving process while continuing to eagerly anticipate your healthy baby. It's also important to be aware that there can be some problems in the remaining twin, but that in most cases of a vanishing twin, the surviving baby is born healthy and without any congenital problems. Davies, M., Rumbold, A., Whitrow, M. et al. Spontaneous Loss of a Co-Twin and the Risks of Birth Defects after Assisted Conception. Journal of Developmental Origins in Health and Disease. 2016. 7(6):678-684. Marton, V., Zadori, J., Kosinszky, Z., and A. Kereszturi. Prevalences and Pregnancy Outcome of Vanishing Twin Pregnancies Achieved by In Vitro Fertilization Versus Natural Conception. Fertility and Sterility. 2016 Aug 24. (Epub ahead of print). Zhou, L., Gao, X., Wu, Y., and Z. Zhang. Analysis of Pregnancy Outcomes for Survivors of the Vanishing Twin Syndrome after In Vitro Fertilization and Embryo Transfer. European Journal of Obstetrics, Gynecology, and Reproductive Biology. 2016. 203:3509. What are the Odds of a Miscarriage Occurring? Will Having a Tilted Uterus Increase Your Risk of Miscarriage? Can a Subchorionic Hematoma Increase the Risk of a Miscarriage? Does Having Morning Sickness Mean You Won't Miscarry? How Is Stillbirth Different From a Miscarriage?